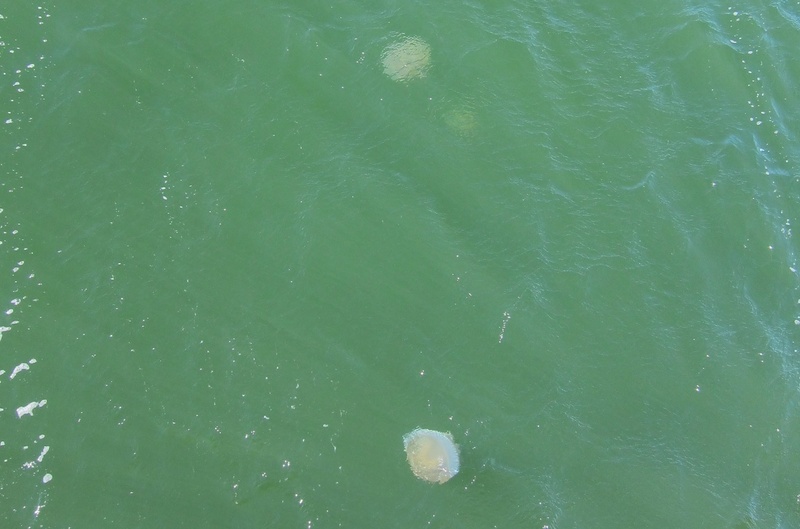 IT takes a few minutes of idly staring at a flotilla of jellyfish the size of dinner plates while enjoying a fag on St Kilda Pier to click that I’m about to be in amongst these foul gelatinous beasties. Extra incentive not to fall off, I suppose. I’m the only person who accepts a lifejacket (the others are blokes who’ve turned up in schmick new rashies), because while I can swim as good as any English, rips are strangely drawn to me. Also, I have visions of being swept out to sea like my brother was on a lilo one year. Dad was furious: he’d only just bought the lilo from a petrol station. After a quick tutorial that’s delivered in a thick French accent and largely carried off by the wind, we carry our boards into the shallows and kneel in the centre of them with our legs apart. Paddling out a few metres, we get to our feet, always looking ahead at where we want to be going so as not to lose balance. From hereon in there’s a cacophony of splats, as the menfolk hit the water heavily, stagger back onto their knees, rock back and forth alarmingly in a crouching position and fall in again. It’s embarrassing. I feel for them, I really do. Clearly all my pillion riding has paid off, as ironically it turns out I’m the only person who doesn’t need a lifejacket. How do you like that? I could have kept my makeup on. An hour in, a small crowd has gathered merrily on the pier and the men have crimson faces of thunder as I punt around them in a devil-may-care fashion. Look, I wouldn’t fancy my chances in surf any rougher than Port Phillip Bay, but still, I’d like to think I earn the admiration of all around – in fact, I’m quite surprised no one has come up behind me in a fit of jealousy and shoved me in. Keeper? Bloody love it mate. You may see me paddling sedately down the Yarra in the next few weeks.